I am writing this one day late because we got in late last night. We got up fairly late, had breakfast and headed to the prater park. We went to ride the giant Ferris wheel, and at 10:00 am we were the only people in our car and almost the only people on the wheel. With no one clamoring to get on we were able to have a nice long ride and get a nice view of Vienna and the surrounding area. We then went back to the ring and walked along the stretch with the most famous buildings - the opera houses, the Rathaus (City Hall) museums, etc. It was sort of noisy with all of the traffic on the ring but some of the parks were nice. It was getting a little chilly (60 - 65) although the sun was out, so we headed back to the hotel to get jackets. We had planned to take a walk in the Vienna Woods but when we read the description we brought with us, we discovered that the park we wanted to walk in was only open Wednesday through Saturday. But we had photocopied one paragraph describing another walk in the vineyards surrounding the city, so, armed with that and a transit map, we set off. Took the "D" tram out to Nussdorf and walked up some streets named after Beethoven - it was here that he took some of his inspirational walks. Had lunch at the Beethoven statue, as a Japanese camera crew took video footage of it. Then we hiked uphill for about two to three miles to the town of Kahlenburg, which has a beautiful view overlooking the city. We hiked up to this point (Kahlenburg) including one stretch of 163 steps in a row (we counted them on the way back down). We admired the view and spent fifteen minutes waiting to be served in a wine garden before getting our refreshments from a concession stand. 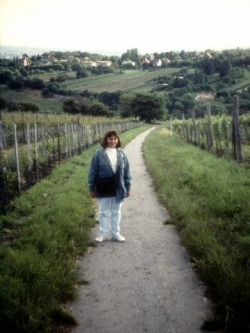 We then hiked back down through the vineyards to the town of Grinzing - famous for its Heurigers - or wine bars. They have special dispensation which allows them to serve their own wine and food. The wine is served by the mug ! We were so thirsty we had two mugs at the first place which had mostly Germans in it. Then we walked up the street to another more touristy place and another mug with some food from the food bar (pork of course) on the way back to the tram we stopped for one more in a place that was all local people. Some 80-year-old was chugging mugs of wine and playing an ancient Hohner accordion. We told him we were from New York - his comment was "Eine grosse stadt" and "Eine machine. Here in Wien we are much more slow." That was about the extent of his English. As we were about to leave we started chatting with two Viennese women about 65 years old. They were very nice, and we showed each other wallet photos. One spoke fairly decent English and had been to the U.S. 25 years ago. They wanted to know how much money we made and why we had no "Babees" after 5 years of marriage !! We ended up exchanging addresses - maybe we'll send a Christmas card. On the way back on the tram I chatted with a very drunk 67 year old from Finland who likes photography - His wife was very embarrassed at his state. By the time we got back, at 11:00 pm , I was in no condition to write and we went straight to bed.